Clarice Beckett is considered the most significant of the Melbourne group of artists associated with the tonalist painter Max Meldrum with whom she studied from 1917. From the platform of Meldrum's instruction, Beckett developed an original aesthetic, expanding on her teacher's rigid 'scientific' system of tonal construction into one that explored the poetic extensions of ambience and place. In doing so, Beckett produced one of the most distinctive bodies of works seen Melbourne's inter-war decades. Beckett's favoured artistic terrains, her subjects were also of an urban (and suburban) modernity. Drawn to ideas of Theosophy as a creative stimulus, Beckett composed elements of the suburban everyday (cars, trams, telegraph poles, and tarred roads) into poetically-hazed city and land-scapes which transcend everyday reality and hint at the supra-real or infinite. 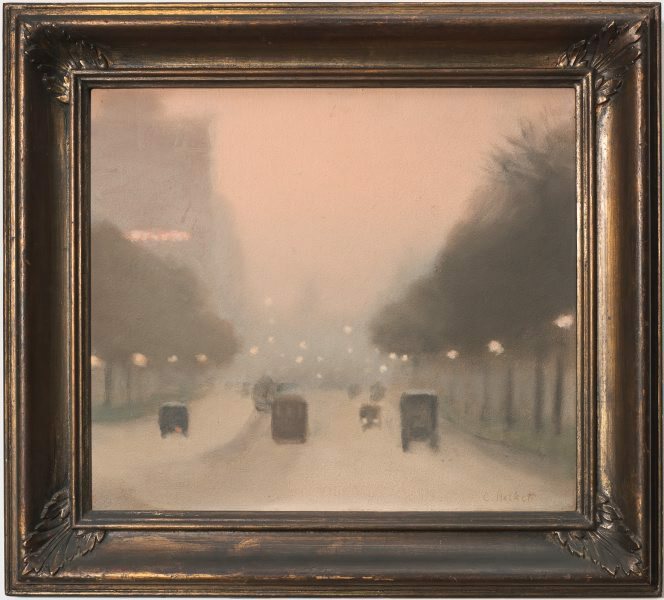 'Evening, St Kilda Road' lyrically elaborates the artist's signature subject in an image of the city's soft-focused modernity. Fusing an urban electric glow with twilight's ambient luminosity, Beckett explores the sfumatoed limits of representation, using darkened box-shaped cars to retrieve her composition from a misty point of abstraction. Beckett activates colour for potent atmospheric effect, enveloping the city with a rosy-toned veil that evokes the last moments of twilight. Beckett's preference for early evening or morning subjects was not for simple poetic effect. 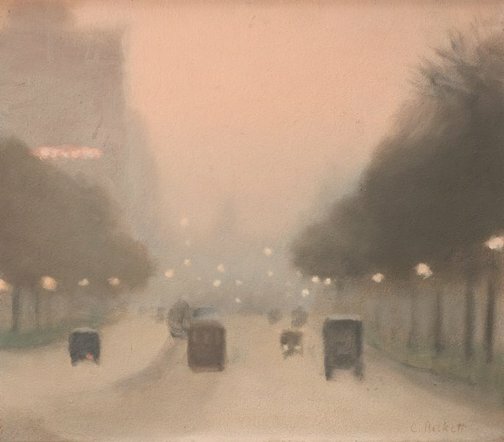 Instead, as 'Evening, St Kilda Road' demonstrates, she was drawn to the technical challenge of painting the essence of her subject within the fleeting moment; and of observing light effects and developing delicate tonal nuances that blurred the terrains of reality and illusion. Signed l.r. corner, brown oil "C. Beckett". Not dated.